What is Chao Zhou Clay Pot? Chao Zhou red clay pots are made of clay from Feng Xi located on the Feng Huang (Phoenix) Mountain. 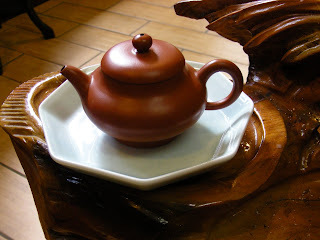 They are hand thrown on wheels with fine grains of red clay imitating YiXing style. Walls are made very thin. The locals also call it Zhuni although not the same clay as Yixing Zhuni. 2 most famous makers are the Wu's and Zhang's families, generations of pot makers followed traditional techniques, also innovated new styles and techniques. After more than 100 years of making Chao Zhou clay pots, the outstanding current generation makers are now hired by YiXing factories as consultants. What a turn around! spout is medium to big that is easy to control pouring speed since dan cong is extremely sensitive to timing and temperature. size of pots are small, makes 3 to 4 little cups of tea, just enough to drink it fast while it's hot. it's also a timer, after pouring hot water over the exterior, when dried, the tea is also ready for the first 2-3 brews. How to break in a Chao Zhou clay pot. Rinse under room temp running water, scrub off the dust inside of the pot. Then soak in room temperature water for 20 minutes. You can now add off boil water to rinse. Then add teas you don't like and hot water into the pot, soak for a few hours. Change tea and make another pot to soak over night. The pot is now ready to be used. In case there is still clay smell, soak another pot of tea over night or until you are satisfied. Do NOT boil them like the YiXings! For normal usage, soak the pot in room temperature water for 20 minutes before adding hot water. Else it can crack. (It's not always the case for every pot, but I don't think you want to take the chance.) They are very thin, so more prone to easy breaking. I cracked half a dozen pots myself, it took me that many times to figure out what to do. For speedy raising the pot, take out tea leaves and empty all the tea after brewing, leave the lid off and let it dry without rinsing. With some old bush Dan Cong daily brewing, you'll have a very nice pot in a couple of weeks. For current year Dan Cong, gaiwan is better for maximizing the aroma, while Chao Zhou clay pot can smooth and deepen the flavor and texture of tea. You should also try brewing young green Sheng Pu-erh with a Chao Zhou clay pot, you might find surprising outcome.